This Barb originates from the Mekong and Chao Phraya River basins of Thailand, Sumatra, Borneo, and Malayan Peninsula. They live in river channels and deep fast flowing streams. No external differences between male and female. A large fish that forms schools, peaceful however and can be kept with other large fish including South American Cichlids. Good tank mates can include Oscars, Loaches and Giant Danios. Do not keep with very small fish. Be aware that these fish will grow quickly and will not remain as small bought specimens for long. Omnivorous, will eat larvae, insects, bloodworm, pellets, flakes and vegetables. Needs an exceptionally large tank with lots of open swimming space, and appreciated a good current. Will nibble plants. You should house these fish in the largest aquarium you can provide. A tank of at least 322 Litres (85 US G.) is recommended, although can be housed in slightly smaller tanks if kept in limited schools of 4 to 6 fish with plenty of open swimming space, carefully maintained good water quality and powerful filtration (which will provide a strong current that they like too). In such situations, it is recommended that it should be the dominant fish in the tank with far fewer other occupants of a reasonably smaller size to prevent overcrowding. Will rarely reach it's full size in standard home aquaria, attaining just over half the size of it's wild counterparts is common. 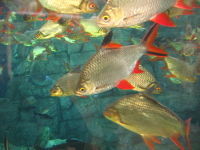 Peaceful shoaling fish, mainly occupies the mid to bottom levels of the tank. A very active and fast fish in advantageous conditions. A large fish, has iridescent silver scales across the high-backed body, the fins are tinged with red, the dorsal is tipped with black and the tail exhibits two black lines. Can be mistaken for Barbonymus altus, but this barb does not have the black lines on the tail.